If I started a restaurant, it would probably be exactly like Austin’s Food Heads; partly because sandwiches and salads are all I would be qualified to make and partly because I’m obsessed with the cozy and eclectic atmosphere they have created both inside the cafe and out. 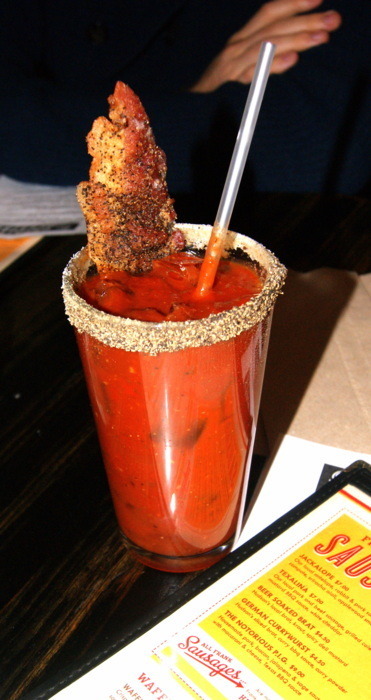 Though, my version probably wouldn’t be as precious or palatable. It’s not hard to make me love a sandwich. I love bread and most things that accompany bread, but Food Head’s finds a way to make the art of sandwich eating a little more extraordinary—namely by getting wonderfully creative with the fixin’s they pack in between bread slice one and bread slice two. I wouldn’t have thought to combine a portobello mushroom, bleu cheese and blackberry balsamic vinaigrette, for instance, but thank goodness a genius at Food Heads did. And thank goodness, too, for someone behind the counter dreaming up a sandwich made of pork tenderloin, jalapeno relish, swiss cheese and tabasco slaw. That, my friends, is a sandwich. 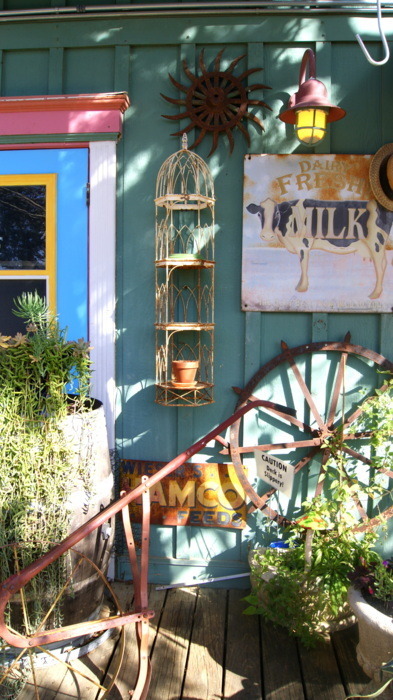 And why not enjoy your Gypsy Grove Sandwich or Fish Torta in a quirky urban garden–a space where old windows are refurbished and used as porch decor and every piece of accouterment from the tables to the saltshakers are mismatched? The walls are brightly painted, the cacti are bigger than your car and if you choose to dine alone there is always a shelf full of books to keep you company. Food Heads, you might just be my new favorite lunchtime treat. 1. 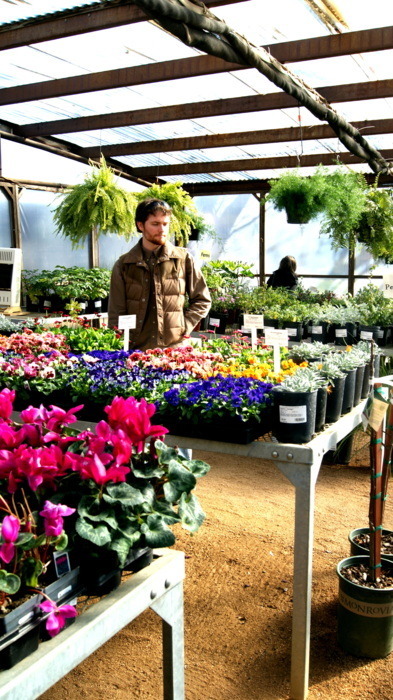 Set your alarm for 8 a.m. on Saturday to attend a gardening class at The Natural Gardener. 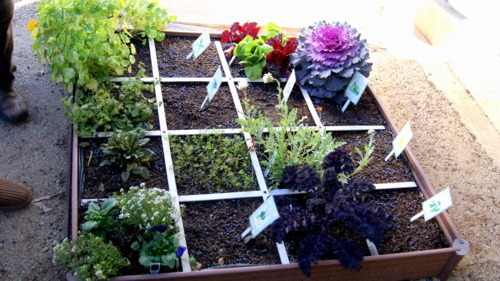 As mentioned in an earlier post, one of our New Year’s resolutions is to start a garden. And not just any garden, mind you. But a fruitful one. We’re not talking tiny sprouts and sad tomatoes, but our own produce section that can sustain the entire household. 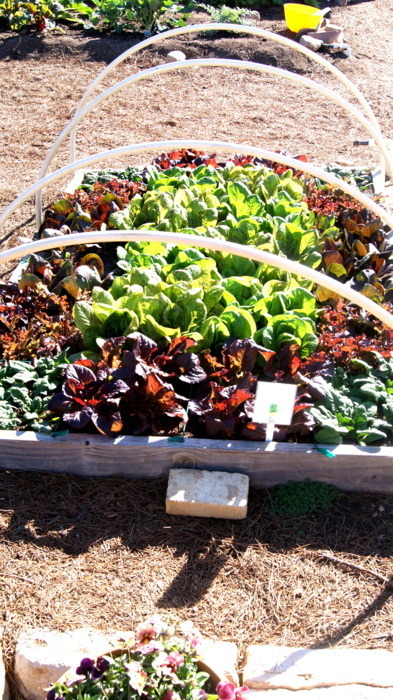 So for that, we hit up South Austin’s organic gardening headquarters for tips on when to plant, what to plant and how to plant it. 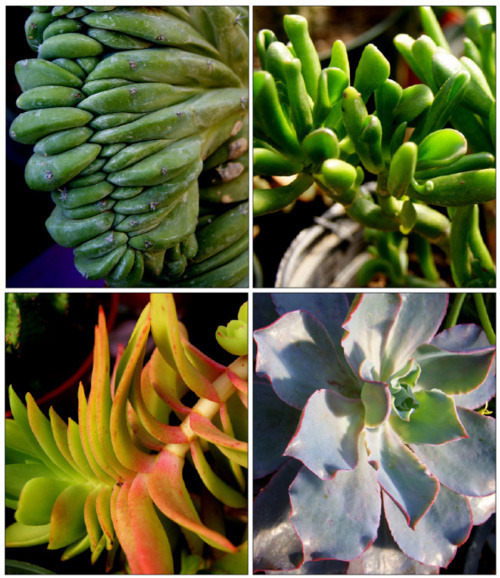 We got some solid advice like how to keep your plants warm in the winter and cool in the summer, what combination of soil, fertilizer and compost creates the best environment for plants, and how to handle disease. The only downside to the event? Our fellow classmates. The event was packed with well over 100 people in attendance (though bear in mind that Heath and I were by far the youngest in the crowd). But as is typical of the 50 plus-year-old person in a classroom setting, there was a hefty amount of one-upping. Audience members attempted to talk over one another in order to make their completely mediocre and uninspiring gardening tip heard to the instructor. Sheesh. What could have been a half-hour class was easily stretched to more than an hour. 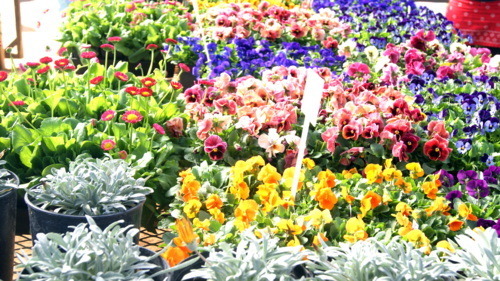 But as mentioned, we did take home some good info and were inspired by some of the nursery’s gardens. 2. Finish your tour of the garden early to make it to lunch around 11 a.m., just as your restaurant of choice is opening. Another of our resolutions was to eat at new restaurants. 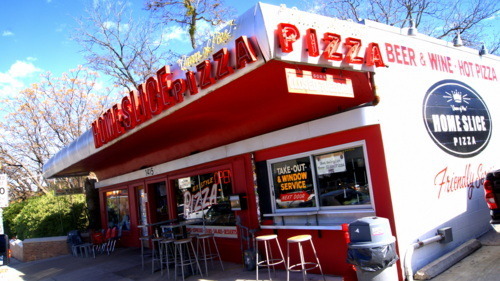 So we picked Home Slice Pizza on South Congress. I have been a fan of New York-style pizza since I worked at Slices and Ices in college. Everyone knows what goes into pizza, so I’ll refrain from blogging much about the deliciousness of grease combined with cheese combined with bread. Suffice it to say that this place is weirdly Austin, and wonderfully tasty. 3. 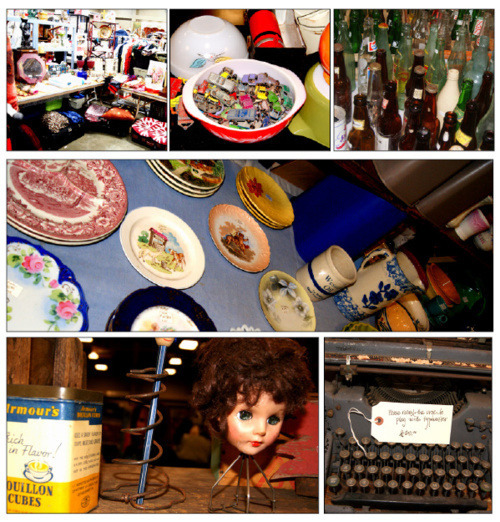 Pinch your pennies by attending the City Wide Garage Sale. Roughly one weekend each month, Austin hosts a collection of knick-knack vendors under one roof in an event known as the City Wide Garage Sale. Not one to turn down a bargain vintage find, Heath and I decided to hit it up. There was plenty to see and appreciate, but the problems with the sale are 3-fold. 1) It’s $5 to get in and $7 to park, so we spent $17 before we walked in the door. 2) There were tons of great items, but none that seemed to be remarkably affordable. Can I find things I can’t find most other places? Yes, is it cheaper than if I hit up Craigslist? No. 3) You have to haggle for prices and I hate haggling. Sure it’s normal at these sorts of things, but I’m still no fan. But I still walked out with a $12 chenille bedspread and some vintage scarves (notice how my old lady-like purchases are in keeping with this week’s blog theme), so I suppose it may have been worth it in the end. 4. Realize you’re not an old couple and start acting like a kid again. Feeling the urge to live up to our actual ages, we upped the ante for the remainder of the day. We met up with friends at Frank for dinner, which features gourmet hot dogs and bacon that comes on everything, including desserts and bloody Marys. 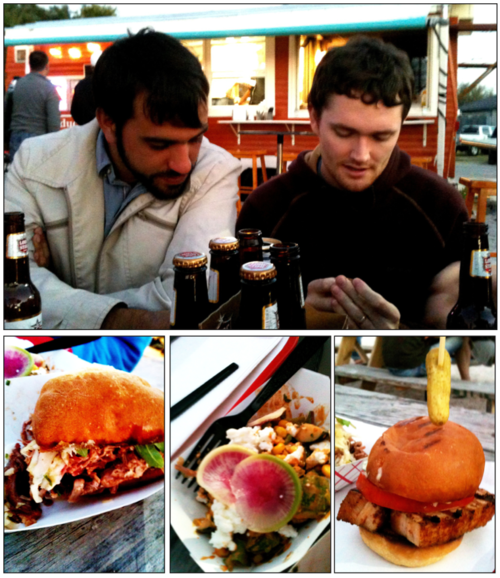 The food was more bizarre than it was tasty, but living in Austin is all about experiences, so why not? From there we went to Mohawk to hear Mother Falcon, a local instrument-heavy band who puts on a great show. Even when rain drenched the outdoor venue, the massive crowd stayed to hear their hypnotically dramatic indie pop sounds. So the day was long, but filled with adventure, which is what living in Austin is all about. That—and being weird. Where else can you start the morning learning about organic gardening and end it with a Lone Star in the rain at a bar named after a Native American with a crazy haircut? And so it begins, the second installment of our HOLIDAY ADVENTURES! series. There is quite a bit of Austin we have yet to see and do. I’m even embarrassed to admit some of it, but we thought the holidays would be a perfect time to scratch some of those “haven’t done ‘ems” off the list and move them to the “been there, done that” column. 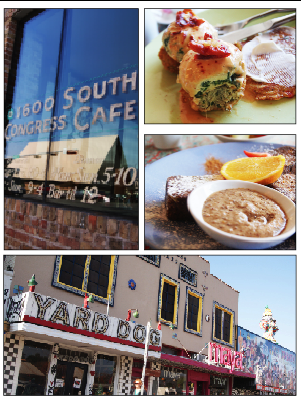 Tuesday we begin our adventure with brunch at the South Congress Cafe. I’m a big fan of brunch and it’s a down right shame that I don’t take part in the delightful hybridity of eggs and french fries more often. The chic cafe has retro touches from its light fixtures to its orange and turquoise color pallet. But, unlike other South Congress staples, it’s anything but gaudy. We were greeted by a hostess but opted to eat at the bar where guests can shave 20 percent off the total cost of their meal with no cuts to service. Plus, I always enjoy the people watching, which is a bit more ample at the bar area. After staring at the menu for some of the 10 most difficult minutes of my life, Heath and I finally decided which food would be lucky enough to wind-up in our bellies. For Heath it was the Carrot Cake French Toast and for me it was the Crab Cake Eggs Benedict. The french toast dish was scrumptious but also rich and proved too much for Heath to finish in one sitting. My fun twist on Eggs Benedict (sub english muffin for crab cakes and eggs for spinach quiche) was equal parts crunchy, moist and creamy. Don’t ask me how they do it, ask only for seconds. After finishing our meal we took off for another never-traveled-to destination: the zoo. Austin’s zoo can’t really hold a candle to the Fort Worth zoo or other animal theme parks of larger cities, but it’s not suppose to. The Austin zoo is a quaint non profit that was established to be a rehabilitation center and animal refuge. You know how you hear about people who get tigers as pets and then realize, “Oh crap, this thing is a tiger!”? Those are the animals that end up in the austin zoo. 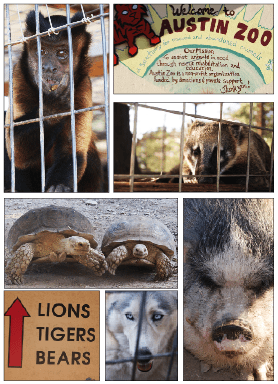 Each animal habitat has information about where the animal was rescued from and how it ended up in the zoo. Some had been seriously injured or abused before winding up in the zoo, but all seemed happy to be there when we visited. Stay tuned for more holiday adventures to come. Some argue that Austin put breakfast tacos on the map (though personally I was eating breakfast tacos from Casa Galaviz long before I moved to Austin—call me a trendsetter). It could also be argued that Austin is making food trailers the hottest new commodity in urban dining. Obviously street food has been around the block (ha) but Austin seems to be taking it to a new level. 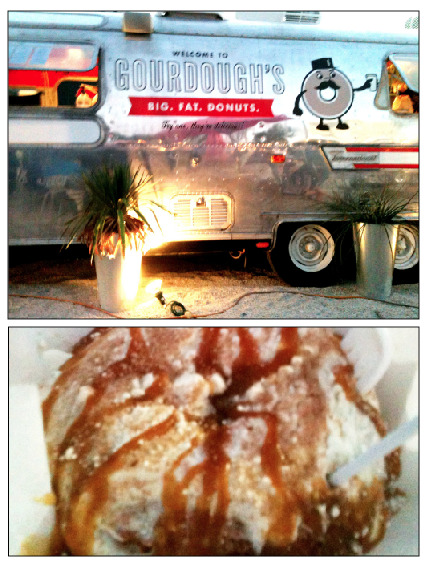 This weekend we hit up Odd Duck and Gourdoughs, two South Lamar trailer favs. I’m embracing the uprising in trailer eateries for several reasons. 1. It’s a great way to eat cheap. You skip on the service (though I’d say trailer servers have often outdone the more traditional table service staff on friendliness) and you can forgo the traditional 20 percent (if you’re a good human) tip. 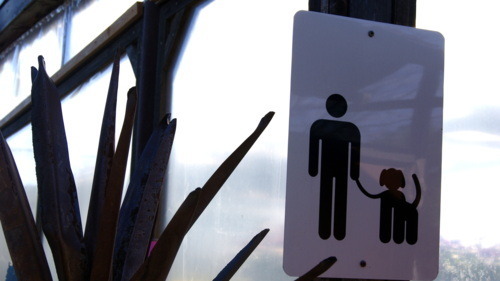 Additionally, most places are BYOB which helps when trying to save that extra cash. 2. Ambiance. There is no better way to experience Austin than right on the street where the action is happening. Maybe you get a little traffic noise, but it’s all a part of city living. 3. The food is good. And it’s usually pretty original. Trailer food isn’t mass produced, so it’s usually a little more unique and often fresher than the frozen meat patties and economy sized cans of tomato sauce generally stocked in sit-down restaurants. Gourdough’s offers a unique twist on the traditional donut, adding candy, syrup and creme cheese toppings to an already over sized pastry. Pictured here is The Peach, but they also had an option called Bring on the Heath, which made us giggle. Odd Duck serves tiny portions of gourmet food. Some of the menu items include quail, pork shoulder and duck egg. It may be gourmet, but all menu items range from just $4 to $6.